Screenshot of the tech demo. 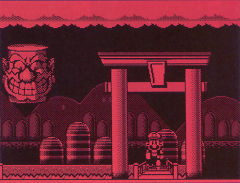 When Nintendo released the Virtual Boy in 1995, they intended to release a full-fledged platformer starring Mario for it. A tech demo of VB Mario Land (originally known as Mario Adventure) was shown at Winter CES 1995, featuring the first level. It was a 2D platformer like previous Mario games, but it also featured top-down view dungeons in a similar manner to The Legend of Zelda. Judging by some in-game artwork, Wario would have been the antagonist. The game ended up being cancelled, probably due to the Virtual Boy's critical and commercial failure. However, one of the demo's features, a battle mode based on the arcade game Mario Bros., was developed into a full game, Mario Clash, and released. Demo filmed on video camera at WCES 1995 in Las Vegas. ↑ VB Mario Land« Games « Planet Virtual Boy. Retrieved October 18, 2015.